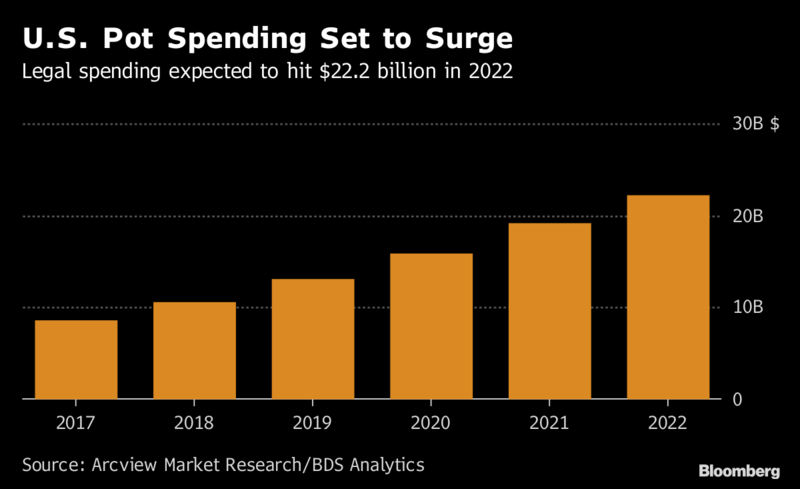 U.S. spending on legal marijuana is expected to reach $22.2 billion in 2022 versus US$5.9 billion in Canada, according to a report released last week by Arcview Market Research and BDS Analytics. CBD is quickly being touted as a potential new wonder drug, with proponents saying it eases everything from anxiety and insomnia to pain and inflammation. Various estimates say the U.S. consumer market alone could be worth tens of billions of dollars. Caution is warranted however, as the Food and Drug Administration has said CBD can’t be added to food or health products without agency approval, meaning it may take longer than expected for CBD foot cream or elbow braces -- two potential products touted by Tilray Inc. in its tie-up with Authentic Brands Group LLC on Tuesday -- to materialize. Demand is clearly not the problem, as supply shortages persist across the country. Instead, it appears to be due to bottlenecks “at multiple points in the supply chain,” including limited cultivation capacity, licensing delays, a shortage of qualified labor, lack of bricks-and-mortar store locations and limited product choice, Kreindler wrote. He expects the issues will begin to subside in the back half of 2019.